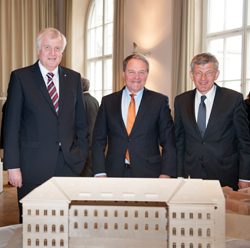 Bavarian Minister President Horst Seehofer, accompanied by Science Minister Dr. Wolfgang Heubisch, paid a working visit to LMU Munich this morning to discuss issues of mutual interest with the University’s Executive Board and with faculty members. In his remarks, Minister President Seehofer complimented LMU on attaining and defending its acknowledged position as the leading university in Germany. He went on to give the go-ahead for the construction of the new Philologicum: “You have the green light; planning work for the Philologicum can begin immediately,” he said. Science Minister Wolfgang Heubisch further underlined LMU’s leading role, as reflected in its great success in the Excellence Initiative, and thanked the University for its wide-ranging commitment to inter-university cooperation. The decision to proceed with plans for the Philologicum will greatly strengthen the position of the Humanities at LMU. The objective of the project is to unite the holdings of several specialist libraries under one roof, but the new Central Library will also provide extra office space. Commenting on the news, LMU President Bernd Huber said: “I am very pleased with the visit of the Minister President and the Science Minister and delighted with the decision they announced. The long-awaited Philologicum will significantly improve working conditions for both researchers and students of the Humanities.” Sited in a prominent location on the Ludwigstrasse, within easy reach of the Bavarian State Library, the Historicum, the Central Library for Theology and Philosophy and the largest University Library in Germany, the planned new Center for the Humanities is set to become an institution of national stature.